Houston –OCTOBER 27, 2015. Joey Logano and the No. 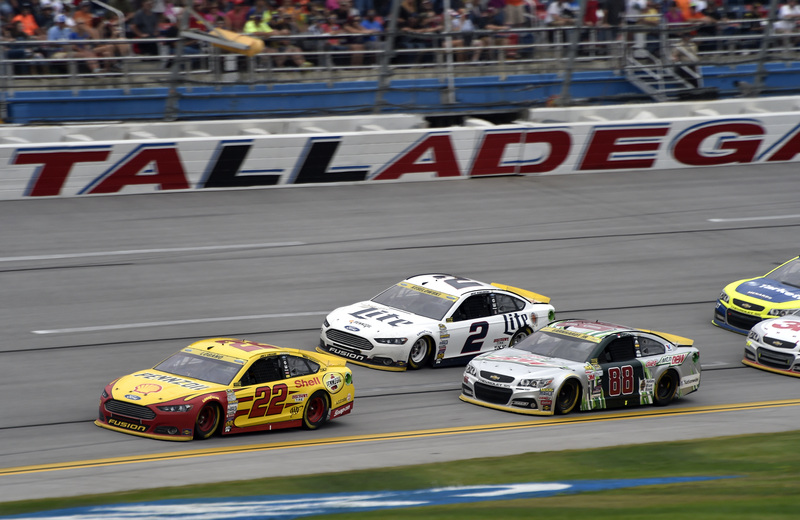 22 Shell-Pennzoil Ford race team followed up a top-10 qualifying time at Talladega Superspeedway to take home the win at the Campingworld.com 500. Logano found himself in the top three when the teams made their final pit stop and took the lead once the stops cycled through. He held the lead through to the finish to score his first career win at Talladega Superspeedway and third straight win overall. With Shell technology under the hood, the win was Logano’s 14th career victory, his sixth victory of the season and 26th top-10 finish of the season. Logano now heads into the three-race Eliminator Round as the series points leader, setting the stage for the Championship race at Homestead in just a few weeks. Shell and Pennzoil® scientists, with the help of Team Penske, use the extreme test bed of the NASCAR track to optimize the special formulation of Pennzoil racing oil that Logano uses in the No. 22 Pennzoil Platinum Ford Fusion. The Pennzoil race oil in the No. 22 car is formulated using PurePlus(TM) Technology, a unique process that converts pure natural gas into high quality full synthetic base oil. This PurePlus(TM) base oil has fewer impurities than traditional base oils made from crude oil, allowing it to fully enhance the benefits of the additives in Pennzoil Platinum® and Pennzoil Ultra Platinum(TM) Full Synthetic motor oils. In addition to blending a unique formulation for the Ford engine from week to week, Shell and Pennzoil scientists also tailor high performance lubricants for the Team Penske gearbox. “The relationship that Team Penske has with Shell and Pennzoil goes beyond a sponsorship. With their world-class knowledge and technical leadership, we are able to customize the racing motor oil which helps us to optimize the performance, efficiency, and engine reliability giving us an edge on race day. We know that our work with Shell and Pennzoil scientists to develop racing motor oils gives us a unique advantage at the track and was a part of the win today for Logano.” said Travis Geisler, Director of Competition at Team Penske. Shell has a long tradition of taking our learnings from the track and transferring that to our high quality consumer products, but that’s not the end of how consumers benefit from our involvement in motorsports. Shell $aver Cardholders also benefit every time Logano wins a points race. Every time Joey Logano wins a points race, such as this one, Shell $aver Cardholders win by receiving a savings of 22 cents per gallon* on any grade of Shell Nitrogen Enriched Gasoline, including Shell V-Power NiTRO+ Premium Gasoline — our latest generation of premium performance fuel delivering unbeatable protection against gunk and corrosion and superior protection against engine wear — or Shell Diesel the Wednesday after the race** – also known as WINsday! There are four more points races remaining in the 2015 season, giving existing and new Shell Saver Cardholders four more chances to save. ** If a points race ends later than a Monday, the savings are available two days after the win. (For example, if Joey wins a race on aTuesday, the 22 cents per gallon savings will occur on Thursday). Shell is a global group of energy and petrochemical companies with 93,000 employees in more than 90 countries. In the U.S., Shell operates in 50 states and employs more than 22,000 people using technology and innovation to help tackle the challenges of the new energy future. The Shell downstream organization manages a portfolio of top-quality brands, including Pennzoil Platinum® and Pennzoil Ultra Platinum(TM) Full Synthetic motor oils with revolutionary PurePlus(TM) Technology and the No. 1 selling gasoline, Shell Nitrogen Enriched Gasolines and premium gasoline, Shell V-Power®. Pennzoil® is the most trusted motor oil brand in America. * The full line of Pennzoil® quality products includes Pennzoil Platinum® Full Synthetic motor oil, Pennzoil Ultra Platinum(TM) Full Synthetic motor oil, Pennzoil Platinum® High Mileage Full Synthetic motor oil, Pennzoil Platinum® Euro Full Synthetic motor oil, Pennzoil Gold(TM) motor oil, Pennzoil® High Mileage Vehicle® motor oil, Pennzoil® motor oil, and Pennzoil Marine® engine oil. For more information about the full line of Pennzoil® lubricating products, motor oils and filters, please visit www.pennzoil.com. Not just oil. Pennzoil®. From gasoline cards to credit cards, the Shell Family of Cards addresses the diverse financial needs of today’s consumers with a range of payment options. For more information about the Shell Saver Card and the Shell Family of Cards or to apply instantly, visitwww.shell.us/cards.